Posted on October 25, 2017 at 2:55 pm. This week we swam the waters and learned about fish. We learned that fish are vertebrates, cold blooded, they have slimy, scaly skin, and some are born with jelly eggs and some are born alive. Some examples of fish were tuna, eel, and the ever popular shark. We know that all fish live in water. 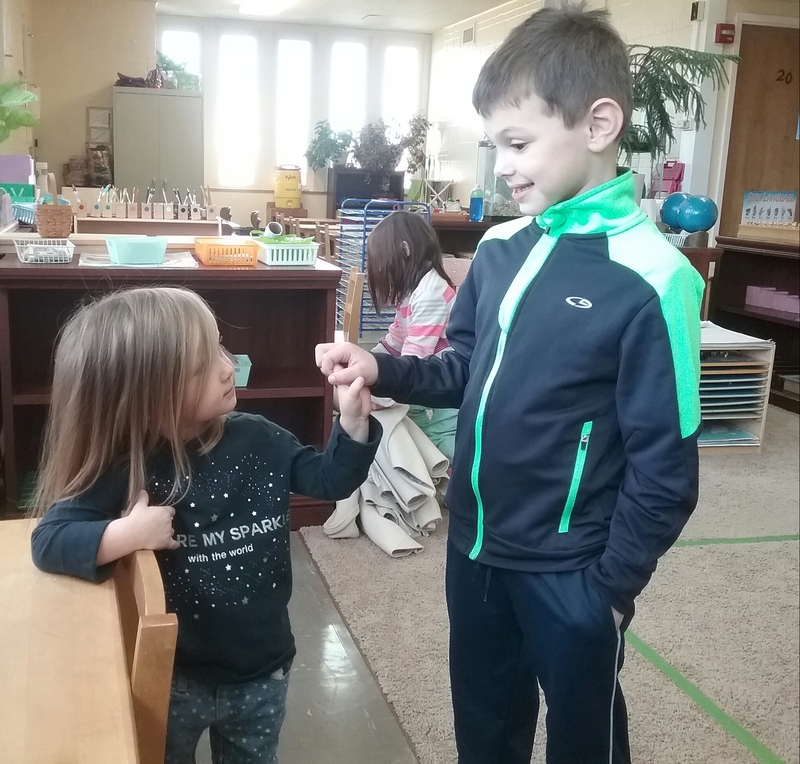 We have been counting to Ten in 11 different languages (English, Sign Language, Latin, Spanish, German, French, Greek, Japanese, Arabic with the Lebanese Dialect, Italian, and Russian). 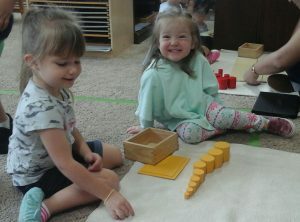 The Primary Montessori Classroom has students ranging in age from 2 1/2 to 6 years. Here are two of my newest five year old children. 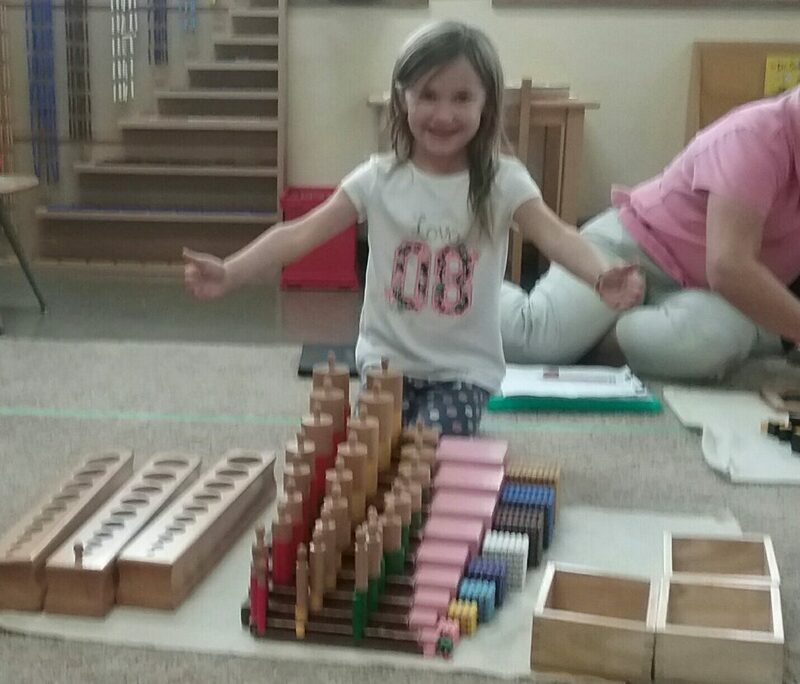 This student combined five different works (knobed cylinders, knobless cylinders, pink tower, brown stairs, and the bead cabinet). She found the correlation between all five of these works. Involved purposes are visual discrimination, fine motor skills, critical thinking, O.C.C.I ( order, concentration, coordination, independence). It took her over 40 minutes to complete this work(s) and that did not include clean up/putting it away. This student is working on an activity that is found in the Language area. 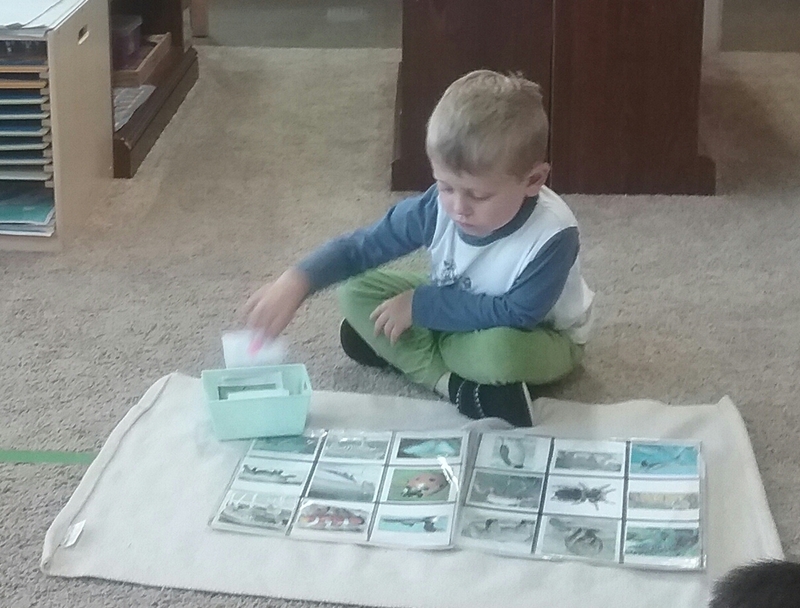 It contains three part cards and focuses on the short vowel sounds. 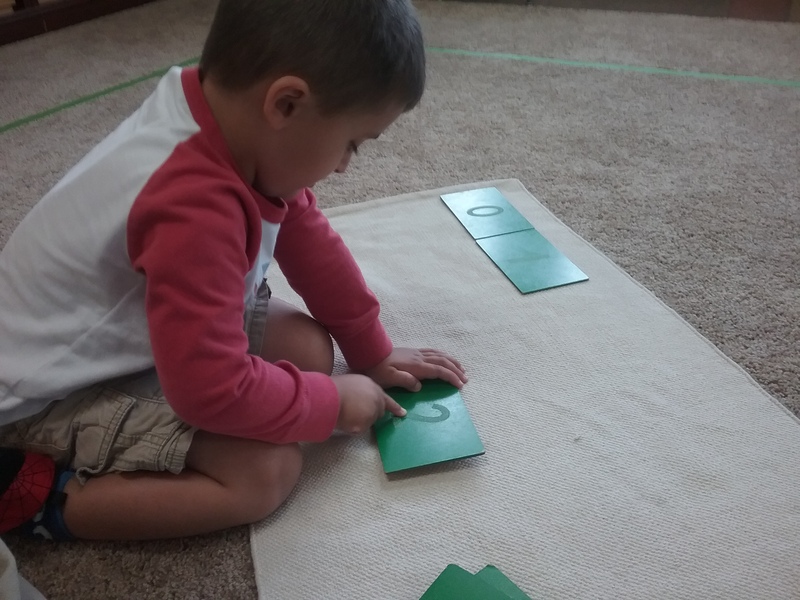 It utilizes three letter words so the child puts together the letter sounds to make a word. The Knobbed Cylinders are found in the Sensorial area and the purpose of this material is visual discrimination of dimensions. 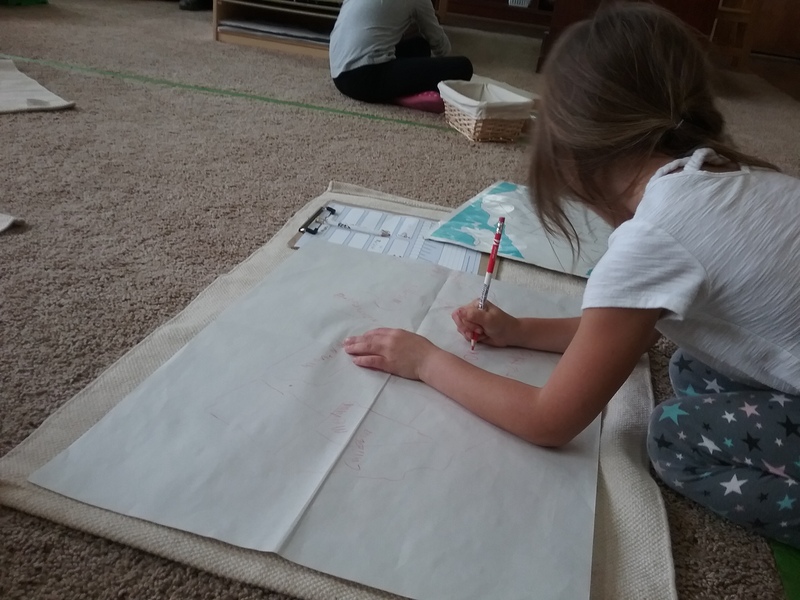 Preparation for writing; coordination of the fingers used to hold the pencil. Refinement of voluntary movement. The child will be able to fit the cylinders with one precise movement. Preparation for mathematics. 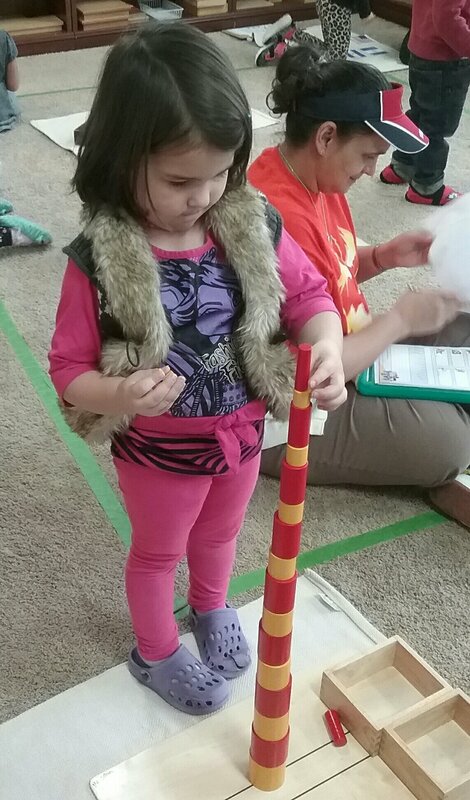 ***** Look at the look of concentration *****The aim of the Knobless Cylinders in the Sensorial area is to observe and compare the different series with each other. Getting a clearer understanding for the different dimensions and their correlation. Birds and the characteristics of. Posted on October 20, 2017 at 2:31 pm. This week we looked at the Amphibian. We talked about how the Amphibians are vertebrates, cold blooded, their skin is soft and moist, and they are born from jelly eggs. Some examples of Amphibians are toads, frogs, and salamanders. We learned that the term amphibian means of two worlds. Amphibians are born in the water but live their life on land. The children enjoyed getting a closer look at our toads, Stiv and Darby and the Pac Man Frog, En Esch. 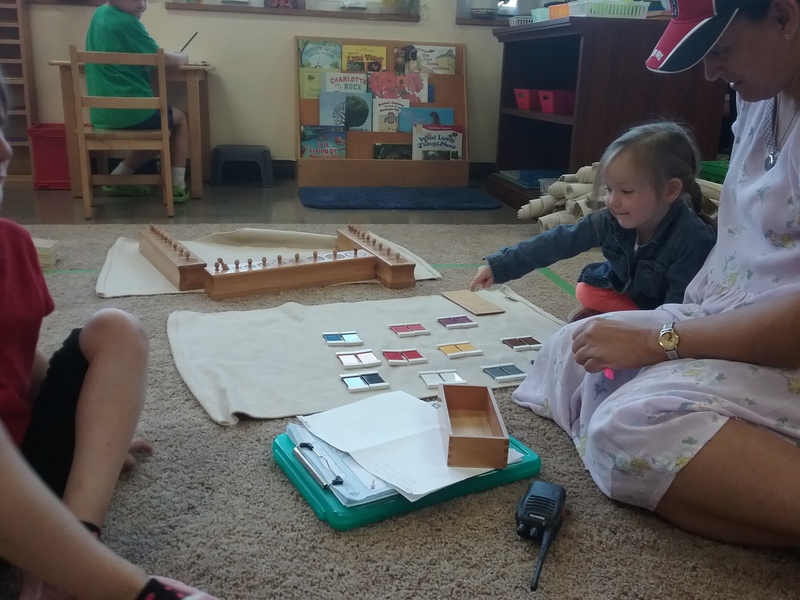 The Montessori classroom has ages ranging from 2 1/2 to 6 years old. Here is a picture of the tallest/oldest and shortest/youngest students in the classroom. The puzzle maps are found in the Cultural Subject area. They are colorful materials representing the continents and The United States of America. 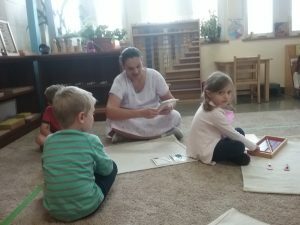 The objective of this material is to introduce the child to a sensorial activity related to working with the countries/ continents of the world. This child is tracing and labeling each state which she is practicing handwriting and fine motor skills. 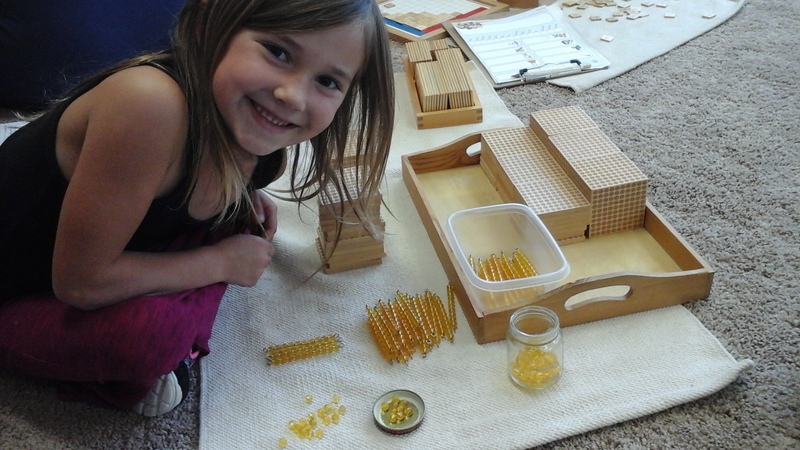 This child is working with the stringing large bead work that is found in the Practical Life area. 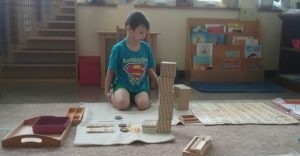 The purpose of this work is to develope fine motor skills, hand-eye coordination, patience, concentration. The main aim in the Practical Life area is O.C.C.I. (order, concentration, coordination, and independence). 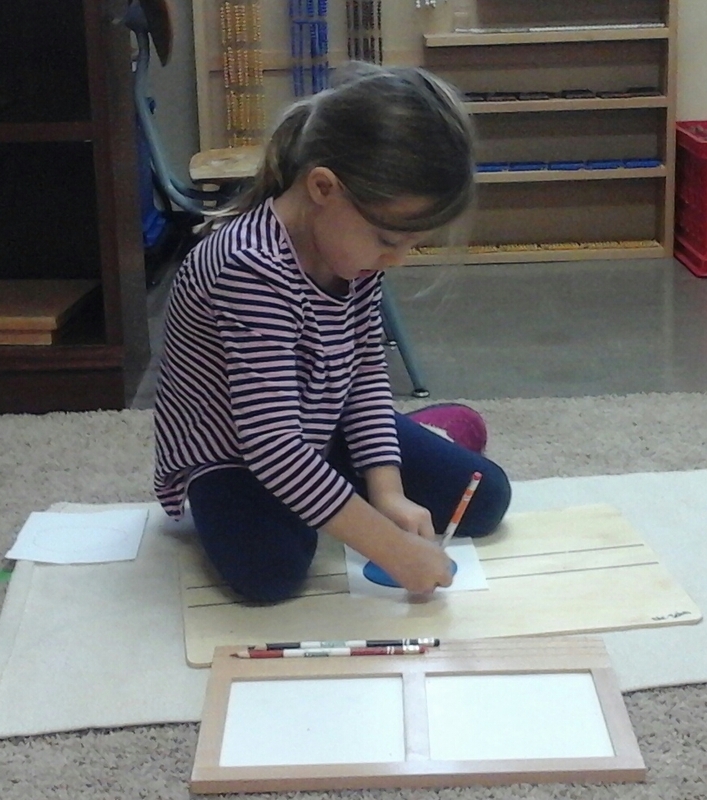 This child is working on Picture to Picture Matching found in our Language area. This material has a variety of interesting pictures that he will match picture cards to the picture frame. The purpose of this material is to develope language by creating a dialogue between teacher and student about the pictures being used. This also develops visual discrimination and concentration. This person is a field student from the University of Akron. 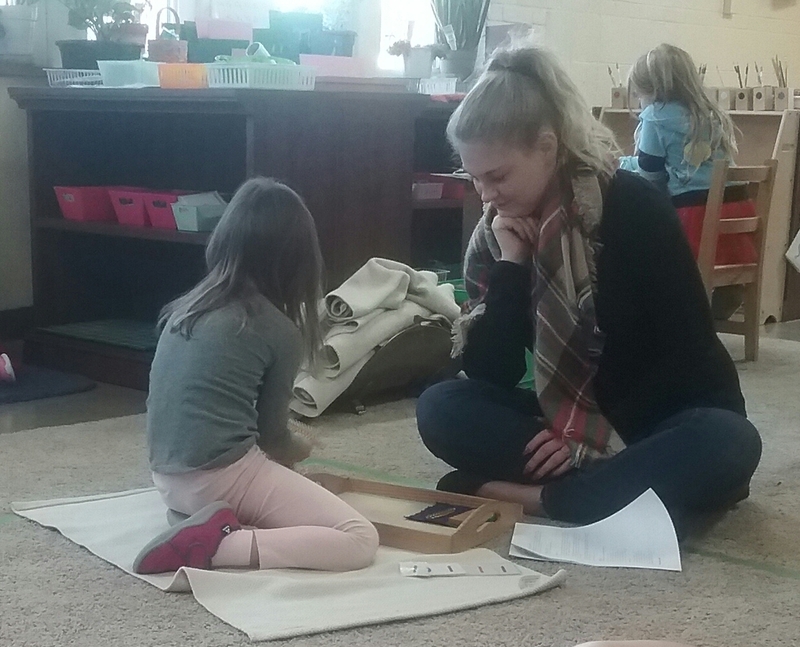 Absorbent Minds Montessori School and The University of Akron have a relationship where field students are invited to our school to experience the Montessori classroom. We will be learning about Fish, the characteristics and examples of. Posted on October 16, 2017 at 12:42 pm. 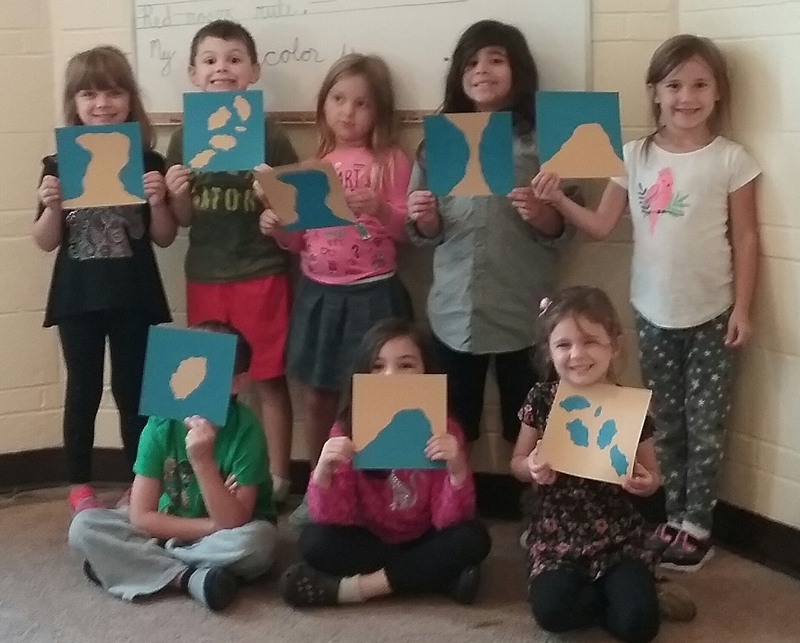 The kindergartners continued with the subject of Geography by studying land forms. We looked at Island/Lake, Cape/Bay, Peninsula/Gulf(not the sport), Isthmus(not Christmas)/Straight, Archipelago/Chain Of Lakes. 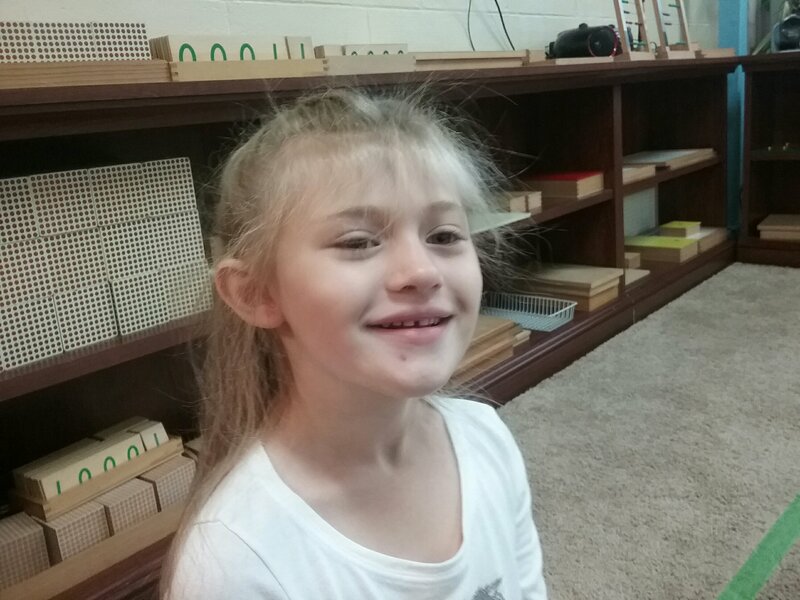 The kindergarten students proudly displaying Land Form Cards. We are going to learn how to tell time (old school). Clock faces, hands, and such. Posted on October 13, 2017 at 4:11 pm. 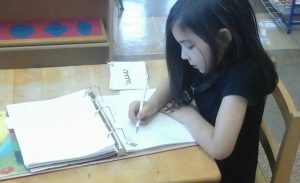 In handwriting , the children are continuing to make progress in writing in cursive! We currently have worked on I through Q, practicing writing the letters by themselves, then writing a sentence containing the letter we are working on that day. The Kindergarten students have also been asking me to write more words once they are finished! 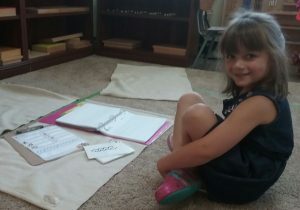 Please keep encouraging your children to practice their handwriting at home as well! I’m so proud of their progress! Posted on October 13, 2017 at 4:10 pm. 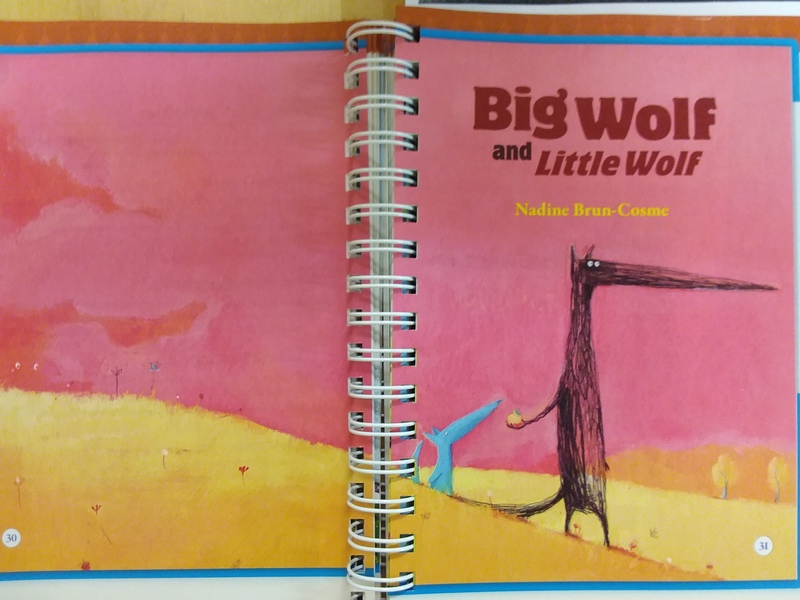 This week was our last week on the story Big Wolf and Little Wolf. 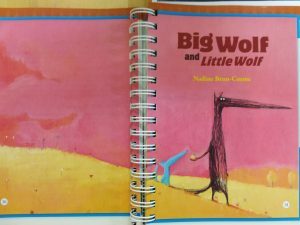 One of the activities that the children had to share was why or why not they would have left the little wolf under the tree. We then led a group discussion about their thoughts on this question. I love when we have discussions like this! I then wrote all their answers on our white board so they could write out their answers. Our last activity the children were able to discuss how they felt about the story and then write about what they would like to do differently the following week. Posted on October 13, 2017 at 3:03 pm. This week we learned about reptiles and what makes a reptile a reptile. Reptile are vertebrates, cold blooded (body temperature changes to the temperature around them), they are born from hard shelled eggs and their skin is dry and with scales. The children loved touching Elise (my Corn Snake) and Oliver (Ms. Kristen’s turtle). 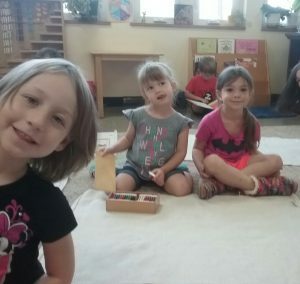 The students can count to ten in 9 languages (English, Latin, Sign Language, Spanish, German, French, Greek, Japanese, Arabic with the Lebanese dialect). Respect, Fun, and Friendship. Here are some of my Breakfast Club Students jockeying for position on MY chair. Respect, Fun and Friendship is all part of the grace and courtesy taught in the Montessori classroom. The metal insets are located in the Language area. This material has several different shapes for the child to trace. The aim is to acquire mastery of the hand in using a writing instrument with direct preparation for writing. The Knobless Cylinders are found in the Sensorial area and the purpose is to observe and compare the different sizes and colors. Another material focusing on visual discrimination. The Plant and Animal puzzles are materials from the Cultural Subject area. 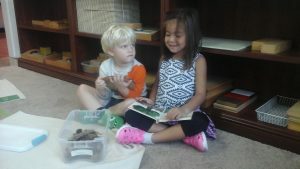 These materials help the child identify the parts of plants and animals. These students are working with the Science Bins(trees) which is a Cultural Subject work. They are comparing the book to a real piece of a tree. In this bin are buckeyes, walnuts, and a variety of sticks. 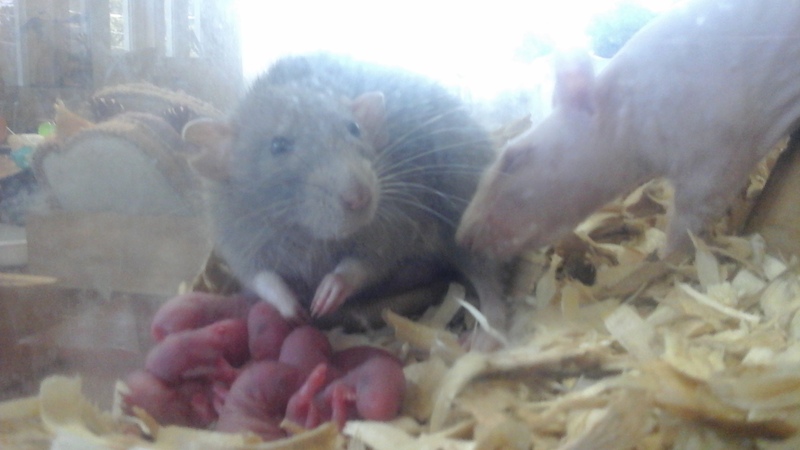 BIOLOGY… Gibby had babies. Last week we just talked about Mammals being born alive and drinking mother’s milk. Roz (in this picture) who gave birth in April helped clean the babies. We will be learning about Amphibians and the characteristics of. Posted on October 6, 2017 at 4:44 pm. 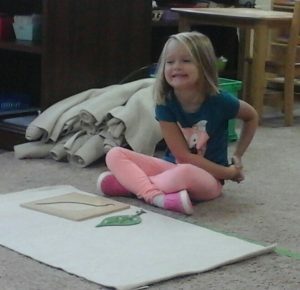 This past week we learned about Mammals. Mammals are vertebrates (have a spine or backbone), warm blooded(their body temperature does not change), have hair or fur, live bearers, and eat/drink mother’s milk when young. Some mammals live in the water such as dolphins and whales. The only mammal that can fly is the bat! Oh and people are mammals! 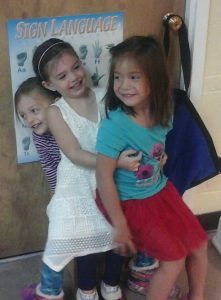 During line time we can count to ten in 7 languages (English, Latin, Sign Language, Spanish, German, French, Greek, and Japanese). We had an alumnus visit our classroom and read. 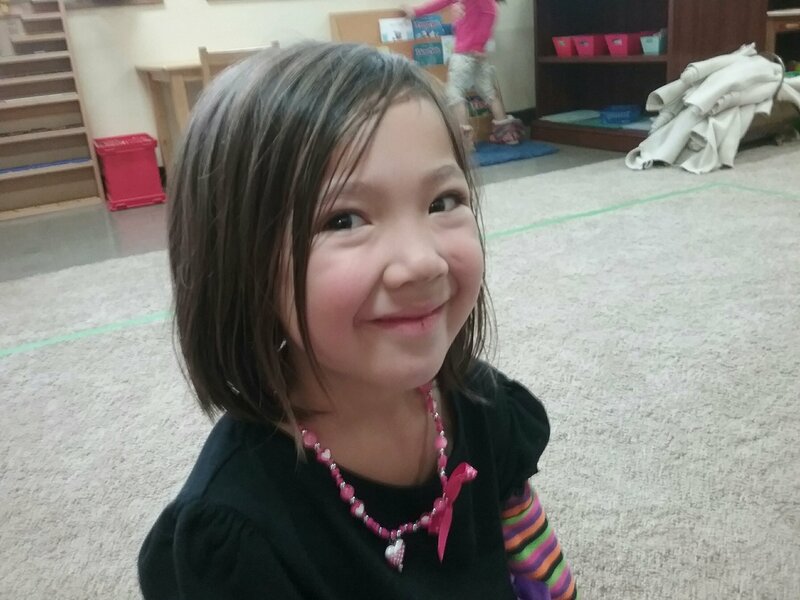 This special alumni student is in 4th grade and goes to Resnick Elementary School. 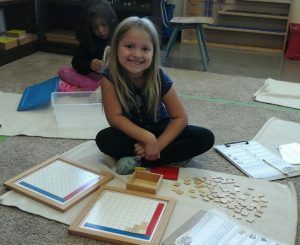 In the Math area you can find the Addition Charts. The purpose of this material is to practice with addition problems which will lead to memorization to facts. 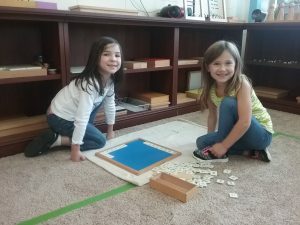 This is a math work called the Exchange Game. 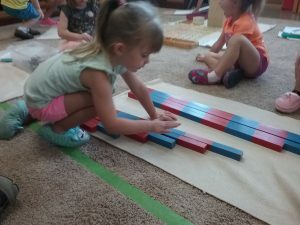 This is the introduction to addition “carryovers” while still reinforcing the comprehension of quantities in the unit, ten, hundred, and thousand columns. Cursive writing falls into the Language area. Research indicates that cursive trains the brain to have better hand-eye coordination and reading efficiency. This material is the famed 9 tray. It connects the symbol(numbers) and quantity. 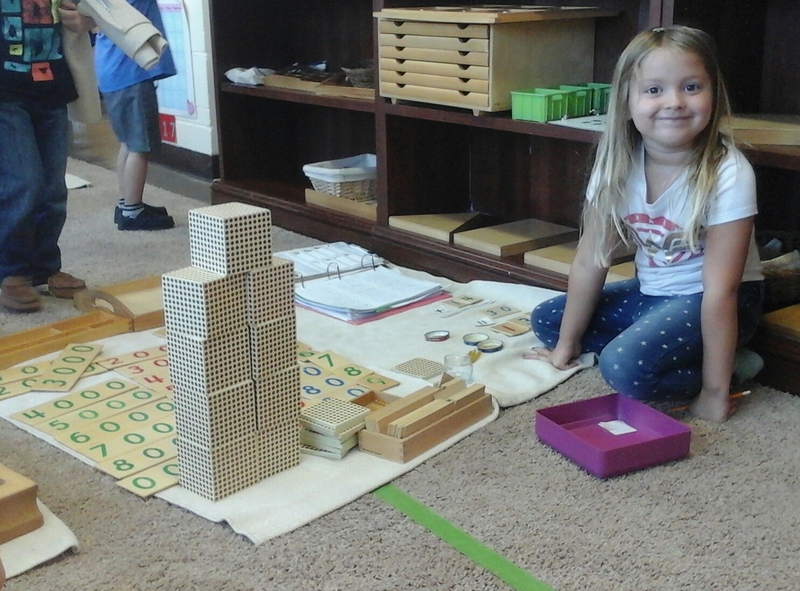 This student is using this material to do addition equations. Students learn the operation of addition, visual representation of addition, and learn vocabulary of addition such as addends and sums. Geography, YAY! 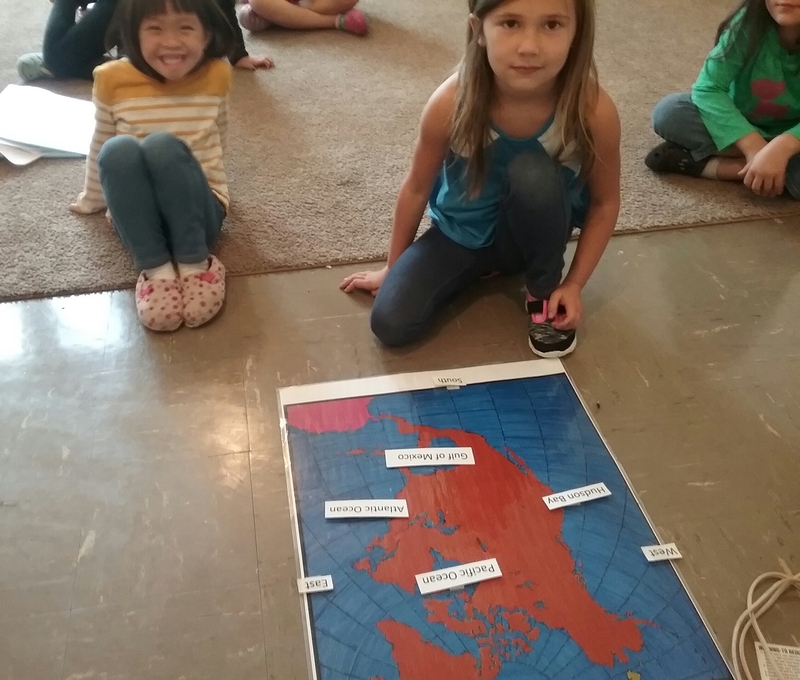 We were focusing on the bodies of water that are adjacent to the continent in which we live, North America. To the north is Hudson Bay. To the South is Gulf of Mexico. To the East is the Atlantic Ocean. To the west is the Pacific Ocean. In our neck of the woods are the Great Lakes. Reptiles! Their characteristics and example of reptiles. Posted on September 29, 2017 at 2:20 pm. This week we talked about living and nonliving things. Your children now know what makes a living thing a living thing! All living things reproduce, grow, eat or take in nutrients, breathe or exchange gas, and need water. We are all in agreement that plants, animals, trees, grass, are living things! 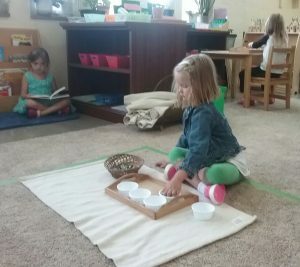 A Montessori classroom consists of multi aged students. 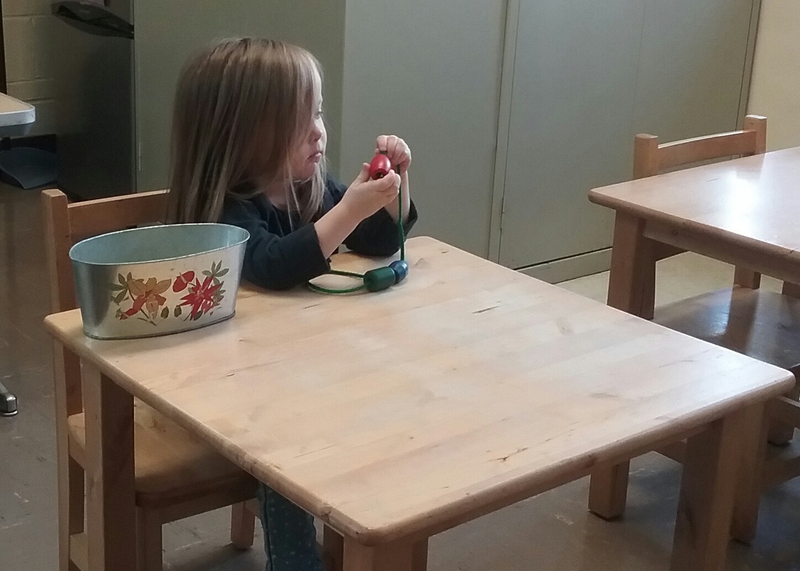 In the Primary Classroom we have 2 1/2 to 6 year old children. This is our newest 3 year old! The Number Rods are one of the beginning materials in the Math area. Number Rods help the child experience the “quantities” in addition to counting from 1 to 10. This Math work is called Cards and Counters. This reinforces that each symbol (number) is made up of separate quantities. *** Notice the other students observing the student working on this material *** A big part of the Montessori classroom is the student learning from their peers by observing or by the older student teaching younger students. Color Box 2 can be found in our Sensorial area. It is very attractive to our children with all the colors it contains. 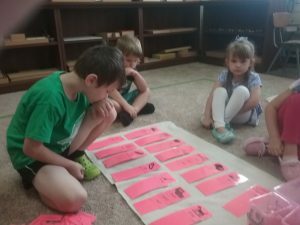 The children match the colors and identify what colors they are. We also introduce the terms primary colors and secondary colors when the student is ready. Characteristics: Warm Blooded, have hair or fur, vertebrates, born alive! Posted on September 22, 2017 at 6:31 pm. This week we had fun learning about the food groups in our class. Grains and Cereals, Fruit and Vegetables, Dairy (my favorite), meats and proteins, fats and sugars and how many servings we should have per day. Next week we will be identifying and learning the characteristics are of living things and non living things(non-living thing: me at 5 am in the morning). Notable events of this week was the death of guitarist Grant Hart from the band Husker Du and actor Harry Dean Stanton (Cool Hand Luke, Repo Man, Pretty In Pink, Wild At Heart). Beginning to intermediate works in Math, focus on the correlation between quantity and symbol. This material (the 9 Tray) includes the quantity and symbol but goes beyond that and focuses on the unit, ten, hundred and thousand columns using the Golden Beads. Kept the photo bomb! Color Box II contains 22 tablets/11 colors, primary colors, secondary colors, brown, gray, pink, black, white. 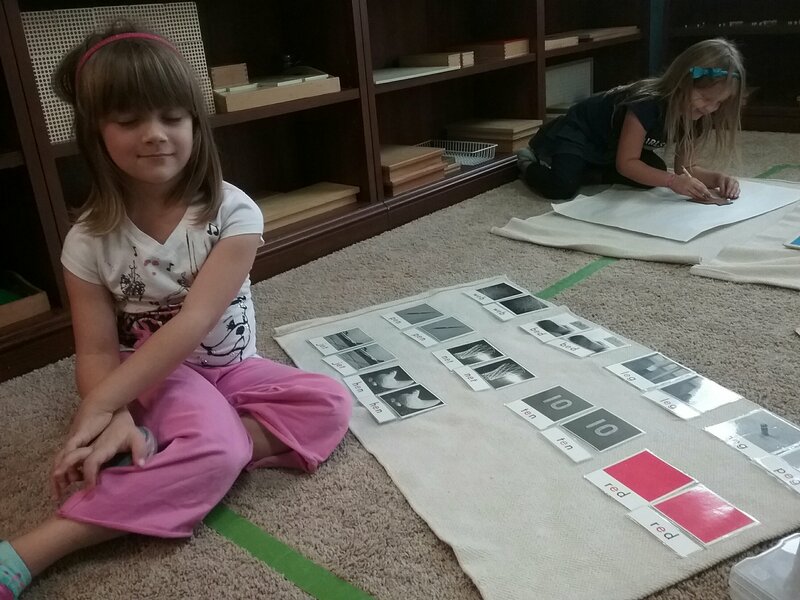 The student gets familiar with these colors. 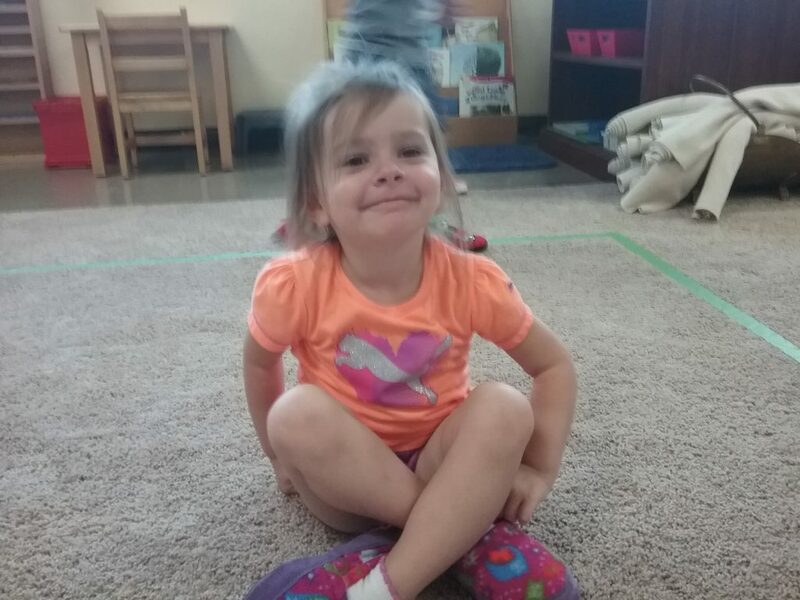 The child matches colors and identifies the name of the color. Practicing cursive- Since all cursive lower case letters start from the same beginning point, the confusion resulting in reversals or inversions is eliminated. Cursive letters are more distinct than printed letters. 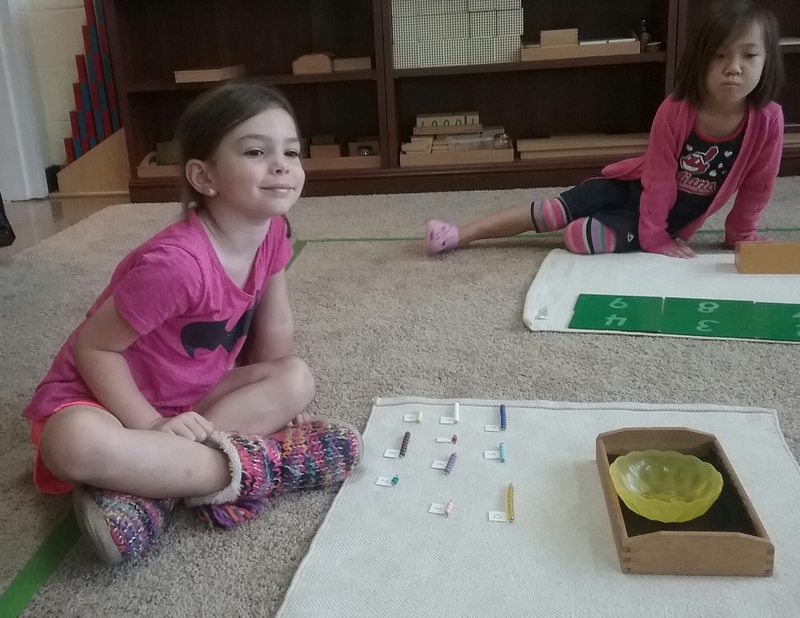 The color Beads Bars are found in the Math area. Again, this material uses the concept of quantity and symbols. Each color bead represents a quantity( 1 through 10). The visual of the different color beads is particularly enticing for the child. Posted on September 15, 2017 at 2:36 pm. Such is what brings me to our classroom topic this week; Healthy Habits! 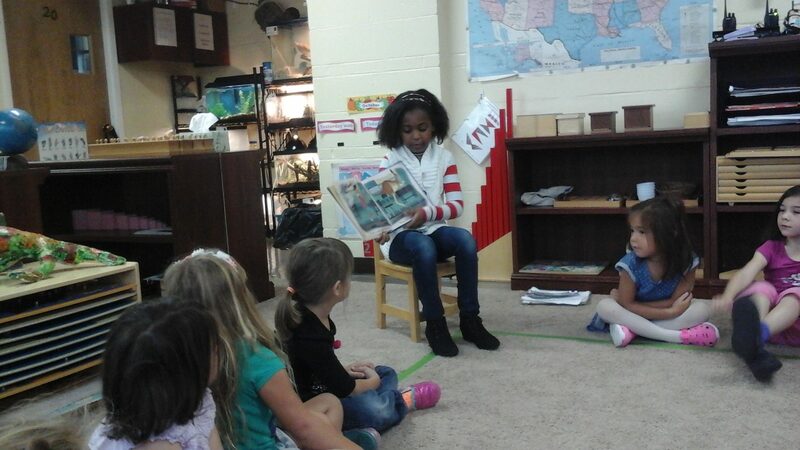 We discussed how important our personal hygiene is. How we wash hands, brush teeth, eat healthy, exercise, and get plenty of sleep and next week we will visit the Food Pyramid and healthy eating habits, you can even find nutrition systems online, which sometimes are low cost, and easy to follow, so after you select it, you just need to figure out the nutrisystem cost. 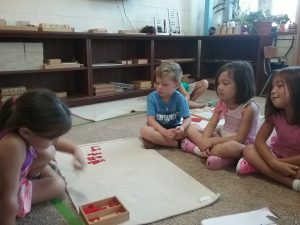 The Number Rods found in the Math area help the child experience the qualities of each number and to learn their names. To show that each number is represented by a single object, as a whole, separate from others, and help memorize the sequence of numbers from 1 to 10. The purpose of the sand paper numbers is to teach the child the symbols for the numbers he knows. To provide him with the keys to the world of written numbers. In addition the student uses their tactile, sight, and auditory sense with this material. Children are drawn to this sorting exercise found in our Sensorial area. 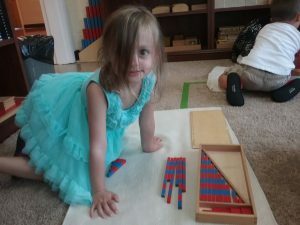 It’s purpose is to refine the stereognostic sense, strengthen OCCI( Order, Concentration, Coordination, Independence), and visual discrimination(which helps the child recognize similar symbols such as 6/9, 5/2, b/d, p,q). 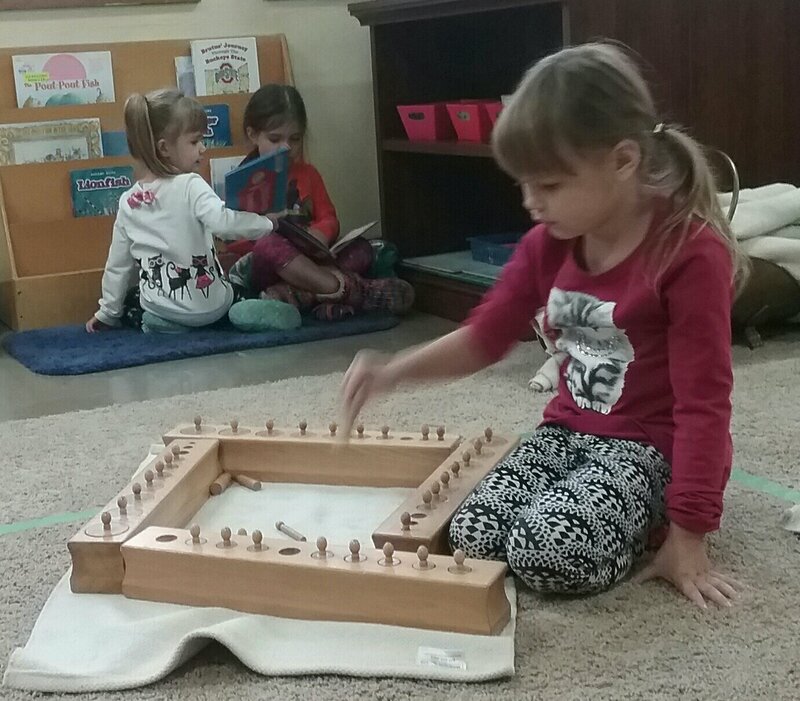 The 100 Board is a Math material that reinforces counting in sequence, recognize symbols from 1 to 100, and develops concentration for longer works. A raincoat and an umbrella… a broom and a dustpan… a party hat and a cake…What else goes together? Young children are drawn to the clearly presented photographs of familiar objects as they become aware of the relationships between things. We also discuss the associations and point out other examples in the everyday world. A Peek into Next Week… All about the Food Pyramid! Ramseyer Farm Field Trip Friday, September 22. Please make sure your child is in tennis shoes and is dressed for the weather. Please send lunches in a disposable container with disposable items. We will be unable to warm up leftovers at the farm.